Threading! Probably everyone knows about it. Threading is a simple non-invasive technique that removes the facial hair. Threading includes removal of excessive hair follicles to shape the eyebrows, remove the facial hair in forehead, chin and cheeks. However, threading is more inclined towards eyebrow shaping. Eyebrow threading has been in practice for thousands of years, with origins in Europe and the Middle East. Eyes define the beauty, defined brows enlivens the dramatic eyes. 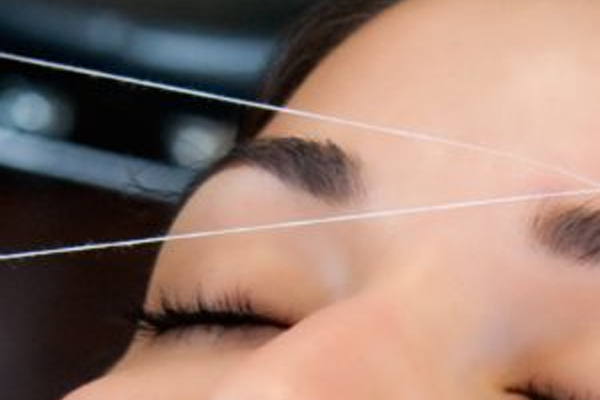 Threading is very common beauty grooming technique that shapes the eyebrows. It is an ancient hair removing technique, has its origin in Asia. It’s been practiced for centuries. On a precise note, threading is a simple beauty technique that shapes your eyes with precision. twists the thread, rolled on the areas that removes the hair follicles in the eye brow. The double strand of thread is swept along the skin, in rhythmic movement with great finesse and precision. Threading removes the short rows of hair at follicle level. It is gentle on skin. There’s an art to creating flattering eyebrows. Here are some of the guidelines a stylist follows to get brows looking full and natural.1. The eyebrow shape should follow the natural brow line. Be it straight, curved, or arched, your original brow shape will be the one that works best with your facial structure and any accessories you came packaged with. Of course, that doesn’t mean all hairs are where you want them. A brow stylist will often begin by getting rid of any hairs that fall below that line before they continue shaping.2. Brows’ starting and ending points are set in bone. The inner edge of your eyebrows should start where the outside of your nose meets the brow bone. Plucking too far in makes brows appear too short, a common at-home mistake that can take weeks to remedy. To get a preview of where your brows should end, place the tip of a pencil at the outside of your nostril and angle it so that it touches the outer corner of the eye. Where the pencil touches the brow bone is where the outer brow edge should stop.3. Your brow artist will look you straight in the eye. That’s in order to pinpoint the outer edge of your eye’s iris. The highest part of the arch should hit right above it, and everything beyond that point begins to taper off.4. Plucking isn’t everything. After the shaping is done, it’s time for a different kind of artistry. To create a full, smooth look that eliminates any suspicion that your brows got in a fight with each other, the stylist may go back in to sharpen or soften angles or fill in thinner areas with a brow pencil or powder.